About half an hour south of the Dells, the tiny town of North Freedom keeps vintage trains chugging throughout the summer. The last Mid-Continent Train Ride of the season–the Pumpkin Special–is a scenic and fairly soothing way to see what is left of fall colors Oct. 23-24. It’s a short tour–only about an hour round-trip–which makes it ideal for preschoolers and elementary-aged kids. Mid-way through the ride, you can hop off and pick out a pumpkin to take home. Adults should be able to appreciate the antique bench seats that can face front or each other, along with classy wood trim in the renovated cars. Fares: $15, adults; $13, kids 13-18; $9, 3-12. OK, I got cocky. That’s what happens when you’re from the Land of 10,000 Lakes. You think you’ve seen bodies of water in all shapes and sizes. Wrong. 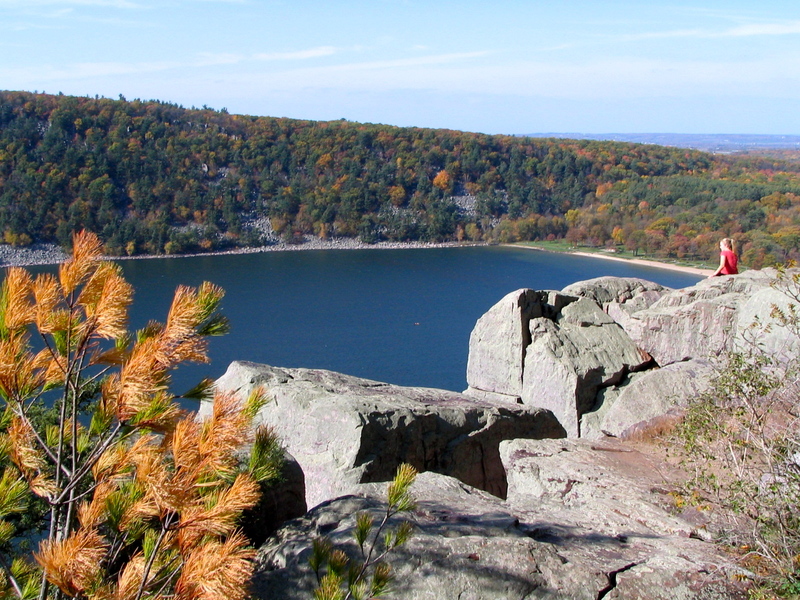 Devil’s Lake State Park near Baraboo (about 15 minutes from the Dells) can drop jaded jaws with its density of color across 10,000 acres, toe-tingling cliff views and wonderfully rugged hikes. 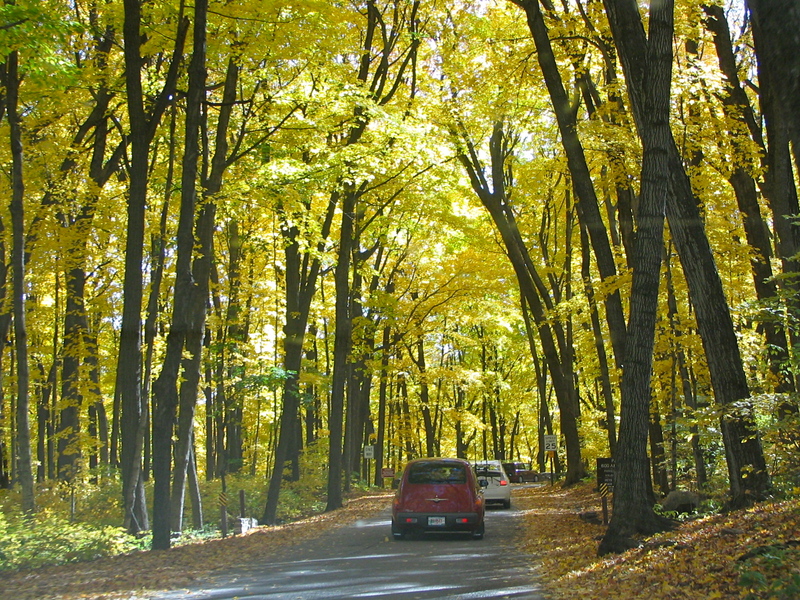 Start with the wooded drive into the park where the very air seems infused with golden fall color. Then hike up to the top of cliffs for sweeping views of the 360-acre spring-fed lake. If you have kids who aspire to be billy goats, hang on tightly and know this is their kind of turf with shaded, intricate rock formations to climb across. Beyond golden yellow maples that arc over the roads, you’ll be able to hike past vivid red maples that look like they’ve been acid-washed with yellow. It’s a funky and memorable pattern that makes the trip a bountiful bonanza for leaf-collectors. Best for kids ages 5 and up. Park admission is $5 for Wisconsin residents, and $10 for anyone out of state. Colors are nudging past peak, but you can get updates through the Wisconsin Department of Natural Resources. If you haven’t had a chance to try ziplining yet, The Wilderness Canyon Zip Line Tour opened one last year that offers plenty of thrills without being terrifying (assuming you’re OK with stepping off a platform high above the trees). The price also is decent at about $45/person for Wilderness Resort guests or $65 for the general public. The route includes five lines across the property’s canyon. Our son, who was 10 last year, was a bit nervous taking that first step, but harnesses feel snug and safe. You get used to the whirring hum of cable as you buzz across it letting gravity do its thing. It’s a fun, fresh way to enjoy being outside and stretching those comfort zones. The zip line also is less scary than the indoor ropes course at Kalahari Resort. Kids (and parents) wanting to try the zip line need to be at least 70 pounds. Additional reviews on Dells-area attractions can be found on the new iPhone app by Melanie Radzicki McManus. Watch for my own app on Minnesota’s best lake getaways by Christmas 2010.